Heritage Medical Center asked TMP to design a new 60 bed, 99,000 square foot hospital to replace its antiquated 1950s-era facility. The hospital is designed to be a sharp divergence from the old building: light-filled, easy to navigate and up-to-date. 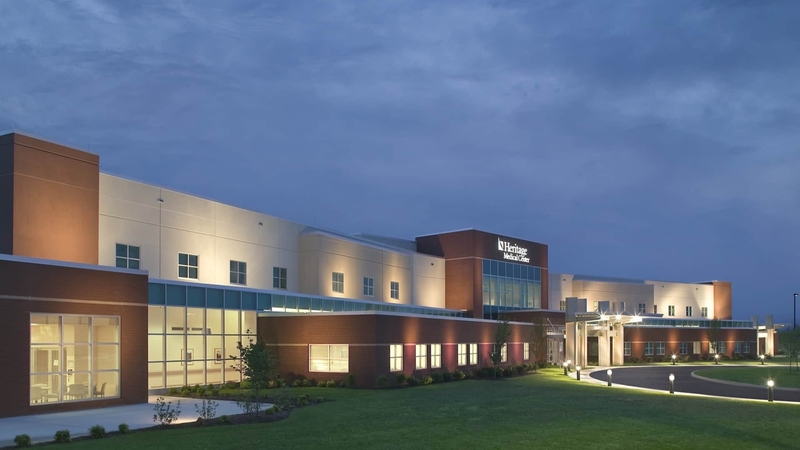 Despite the tight budget, this rural community now enjoys a modern, bright, state-of-the-art healthcare facility. Generous amounts of glass are used on the building’s facades to provide abundant natural light to the building’s interior spaces. High ceilings and clerestory windows are included and lounge spaces are positioned on the exterior walls to maintain a connection to the landscape beyond. Simple circulation provides clear arrival points for patients and well-defined public/private spaces. Smart and efficient layout reduces travel distances between departments. Plans for future growth are accommodated while maintaining a tight, functional design for the new facility. Any addition to the hospital in the future can plug in seamlessly with the present scheme.